ARMONK, N.Y.	- 20 Jan 2014: IBM (NYSE: IBM) is bringing tennis fans even closer to the Australian Open 2014, with new ways to access and interact with the latest tournament news and courtside action from the Grand Slam as it happens. Another new technology is IBM ReturnServe, which enables tennis fans to experience what it’s like to face the world’s top tennis players. Based on live match data analyzed by IBM at Rod Laver Arena, fans can face each serve at home, using their computer or at virtual reality locations in Sydney and Melbourne. The aim of the game is to return serves at the same speed as the world’s best players. IBM ReturnServe is hosted on IBM SoftLayer, the company’s robust and scalable cloud computing platform. “We are seeing increased demand from fans around the world for more access and real-time event content. 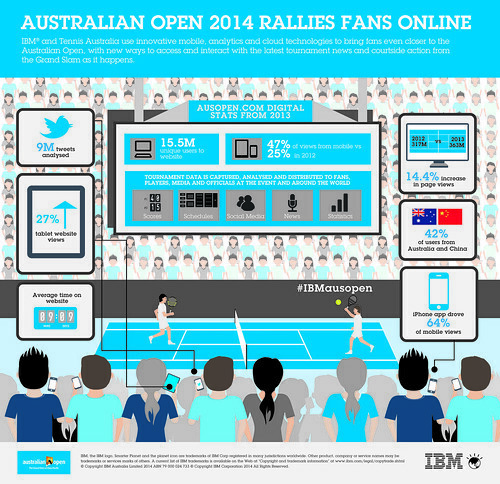 Over the two weeks of the Australian Open last year, more than 15.5 million unique users connected with the tournament online, and almost half of the website views were from mobile devices. Each year we aim to enhance the event experience and this year we have worked with our technology partner, IBM, to develop a new iPad app, improve the website and smartphone apps, as well as advance the technology infrastructure behind the scenes,” said Samir Mahir, CIO, Tennis Australia. Today’s tennis fans also seek a deeper experience that goes beyond live scores and updates. Insights and visualisations provided by IBM SlamTracker on the Australian Open website analyse more than eight years of Grand Slam data to identify patterns in player style. New features to SlamTracker for 2014 include streamlined analysis of more fan friendly key turning points in a match, such as aces and winning shots, and a social media sentiment feed that measures the percentage of positive tweets. IBM predictive cloud provisioning analyses multiple data sources in real-time, such as tournament schedule, player popularity, historical data and social media conversations, to predict and automatically allocate the computing power required by the Australian Open website. “Our 21-year history with Australian Open has been about making the event and the sport of tennis more engaging and enjoyable. This latest focus on the omni-channel experience is no exception. With new digital technologies like the iPad app and virtual reality IBM ReturnServe, the Australian Open is a leading example of the way of cloud computing, data analytics, social and mobile technologies to help better connect Tennis Australia with its target audiences,” said Glen Thomas, Vice President of Marketing and Communications, IBM Australia.